The Panasonic GP-UH532 4K micro camera solution employs a user interface designed for easier control of the system through the operation menu or the rotating knob. Moreover, 6 or more personal profiles can be stored on a USB memory. These configurations can easily be switched to suit a variety of applications. The system indicates Medical Electrical Standards IEC60601* and can therefore be utilized in a variety of medical devices or procedures. Thanks to a coating covering front, top, left & right side, medical and microscopic areas can benefit from the antibacterial coating. Furthermore, various video outputs such as HDMI and HD-SDI allow a smooth connection between the 4K micro camera system and other devices. The high resolution of the 4K micro camera GP-UH532 contains up to 1600 TV lines. The pictures consequently become clearer and include more details. It makes areas or objects, previously unseen, visible and clear. 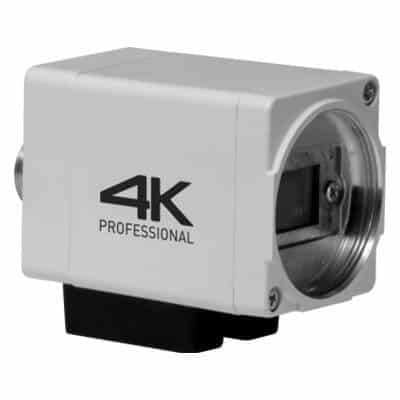 The 4K micro camera GP-UH532 provides a 4K/2K simultaneous dual channel output and enables to use the 2K infrastructure that already exists without using a down converter to create a 2K signal. Therefore, multiple systems can be set up and combined with the 4K micro camera GP-UH532 to create customized solutions. This simultaneous output possibility indicates a cost efficient solution for a variety of applications. The Panasonic GP-UH532 4K micro camera system benefits from a color enhancement functionality which can be switched on and off as needed. In addition to this, the smoke reduction functionality enhances the visibility of chosen areas of the image. This functionality of the 4K micro camera GP-UH532 can easily be switched on and off.